I recently purchased my first polish from the Brazilian Brand Penelope Luz. I chose Pandora which is described as 'a wine base polish with fine magenta, red and black glitters'. These photos show three coats of Pandora with one coat of Glitter Food, and one coat of Rica Glossy Glam. You will need a couple of coats of top coat for this one because it does dry a little gritty. This is a beautiful polish, the only thing I will mention is that I felt like it wasn't overly unique for an indie polish. I could get a similar polish from a brand such as Essie or China Glaze and pay less. I also didn't feel that the black glitter was noticeable unless I really looked for it. Having said that, I did really enjoy wearing this polish, and the formula and application was fantastic. 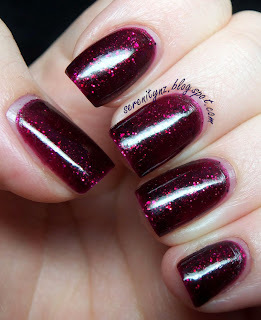 I purchased this from Color4Nails - Check out Penelope's Blog for some stunning swatches.